24th January 2008. In this issue: New ExplorOz Shop System, ExplorOz Mega Draw Major Prize Winners, Recently converted Trek Notes and a Call-out for Plot Files. First Prize: Visitor - O Anderton (WA) who receives a Barcoo Folding Boat Trailer. Second Prize: Visitor - D Schafer (USA) who receives an 8 Day Simpson Desert 4WD Tag Along Tour. Please show your appreciation for the generous participation of our sponsors that donated products to this competition. Many of these are long-term advertisers that also offer Member Rewards and other great deals throughout the year. Thank you to Real-Ezy Trailers Pty Ltd, David and Justine Olsen's 4WD Tag-Alongs, & Hema Maps Pty Ltd. Easier Navigation: By clicking simple text navigation links at the top, you can easily see where you are in the Shop. Multiple Search Options: There are also four ways to search the shop. Finding the right map or book is easy with Geographic Search. Just draw a box in the map of Australia and presto!!! Simplified Shopping Cart: Intuitive and visual and always in view (top right) for your convenience. 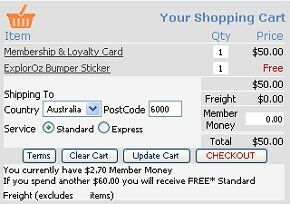 Freight prices are automatically calculated on the fly and you can use your Member Money on purchases. A majority of the ExplorOz trek notes have now been converted to the new format and we are pacing through the rest. A quick way to find the trek notes that have been converted is to click intoTrek Search and look for the ones with a small photo next to the title and description. Please continue to create new or update existingPlaces because they may just appear in the next trek note. The following list contains Trek Notes that have just been fully converted. To send plot files please eitherUpload or email us.